And God Created La Tarte Tropézienne! The tarte tropezienne has just turned 60 earlier this month, and we just couldn’t let this glorious occasion pass without paying homage! Each town in France seems to have its own culinary speciality: Marseille has its famed bouillabaisse, Nice its pissaladière, socca and farcis among many others…and Saint Tropez its tarte tropézienne. Often imitated but never equaled, the original and delicious desert, whose recipe is a jealously guarded secret, is a combination of two velvety creams used to fill a delicious brioche-style cake with a generous coating of sugar. The tart can be found in basically every bakery in St. Tropez but it has also given its name to a chain of patisseries of the same name that is slowly taking over France. 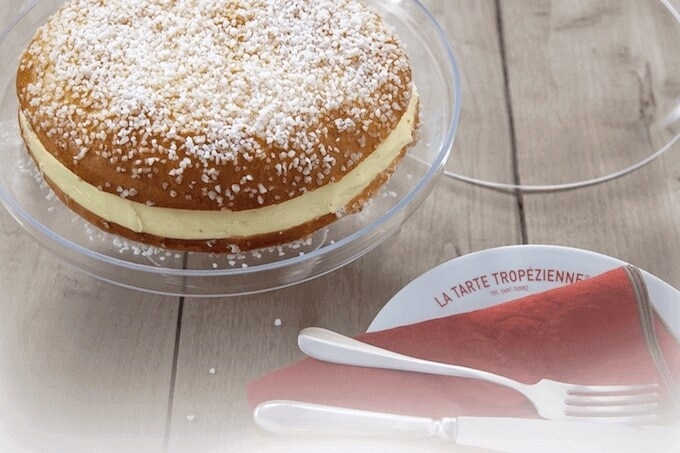 Of course, the success of the Tarte Tropézienne has as much to do with the fact that it is still made today entirely by hand using only the freshest ingredients, as with the colourful story of its creation. Indeed, it all started in 1955 when Alexandre Micka, a recent immigrant from Poland, opened a small bakery on Place des Lices, right in the heart of the little Provencal fishing port, and started making some of his grandmother’s recipes. Asked to cater for a film crew working in nearby Ramatuelle on a film called “Et Dieu créa la femme” (And God Created Woman), featuring the then unknown actress Brigitte Bardot, he brought with him his “cream cake”, which soon became a hit on set. Rumour has it that Bardot herself was so in love with the desert, she suggested that Micka rename it “la tarte de St. Tropez” (the tart of St. Tropez). The rest is history… In 1985, Micka passed his business on to his manager, Albert Dufrêne, but the popularity of his creation just keeps on growing. And great news now for the Niçois; if you fancy a piece of Bardot’s favorite tart, you don’t have to brave the hordes of tourists that inevitably flock to St. Tropez at this time of year: you can simply head to our very own Tarte Tropézienne in Terminal 2 at the airport. So, Bon appétit!